To ensure the safety of your belongings, you MUST change the factory set Master Code to your own unique code immediately! If three incorrect entries are entered in a row, the keypad will shut down for a period of five minutes. During this shut down period you will not get a response from the keypad. Important: Make sure the wires in the keypad housing are not pinched and are securely connected. Controller repeated beeping during an unlocking indicates that the battery is low and needs immediate replacement. Manufacturer recommends the use of 9-Volt premier alkaline batteries and an annual maintenance replacement of the batteries. Single Mode: Open lock with one (1) code (override or user code). Dual Mode: Open lock with two (2) codes (User 1 and User 2 code). Before closing the door, make sure all the changes are correct. Green light will turn on. Always make sure your safe is locked before walking away!. Please see your user manual for the factory set Master Code or contact Tech Support. Always perform this operation with the door open! Test the new code several times before closing the door. When you enter your code, a green light & a red light will turn on for approximately 5 seconds; you will also hear 10 'Beeps'. The safe will probably not unlock when you get this response. When you enter your code, a green light will turn on for approximately 1 second. The safe will not unlock when you get this response. 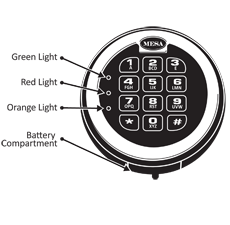 Locate the battery cover on the bottom edge of the keypad & remove the cover by pulling on the tab. Carefully and gently remove the 9-Volt battery from the compartment. CAUTION! Hold onto battery connector to avoid pulling wires out of housing. 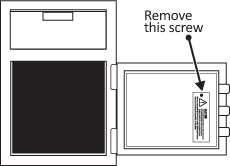 Carefully re-insert the new 9V alkaline battery, do not force the battery into the compartment. 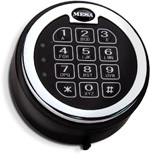 The lock will retain all current codes & settings. Please contact Tech Support at 888.381.8514 for assistance. 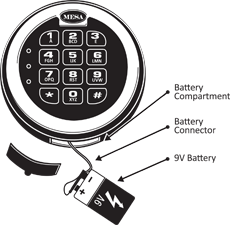 Click Here to view our Mesa Safe Warranty. Click Here to view our Limited Lifetime MBF Gun Safe Warranty. Download the Operating Instructions for this lock & keep them for your records. Do you have the MSL-50 lock or the MSL-500 lock? Click here to download the instructions to determine if your safe has the MSL-50 or the MSL-500 lock.